Nick Ross has come away from the fourth round of the BNT V8s Championship at Teretonga near Invercargill second overall for the weekend and maintaining second place in the Championship. Having qualified position three, the Cambridge racer notched up two third placing’s before taking a lights to flag victory in the final race. 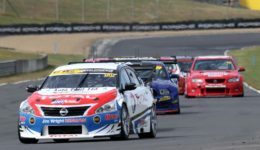 Having raced at the Highlands circuit at Cromwell last weekend, Ross stated that he wasn’t happy with the performance of his Total Lubricants Nissan Altima, citing that he and his Concept Motorsport Team were missing the right set-up on their car to have it a regular race winner. 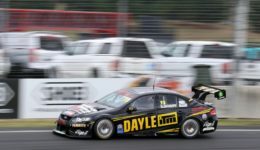 Though the results at Teretonga were good, Ross feels, the performance of the Nissan isn’t quite there yet. “We‘re still chasing the set-up in the car. We made some pretty big changes this weekend, but we’re not quite where we need to be,” said Ross. “We’ll take the car home, pull it apart and see if we’re missing something. 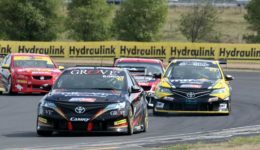 Ross is chasing down Championship leader Jack Smith, who won the opening two races of the weekend, but failed to finish the third race after a fierce battle with Ross. Smith suffering a suspension failure and ending his race in the pits.